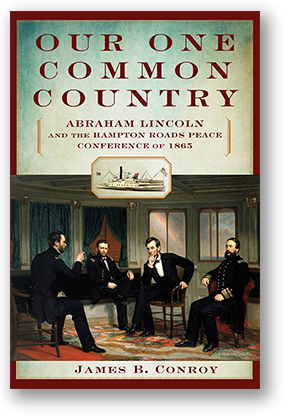 James B. Conroy will present his highly regarded book, Our One Common Country. Mr. Conroy has been a trial lawyer in Boston for 32 years, and was recently elected a Fellow of the Massachusetts Historical Society. Our One Common Country is his first book. Mr. Conroy earned a bachelor’s degree at the University of Connecticut in political science and history and served for six years as a photographer and a journalist in anti-submarine aviation units in the United States Navy Reserve. He has worked as a writer and editor for public interest advocacy groups in Washington D.C., as Press Secretary for an Iowa congressman, as chief speechwriter for the President of the American Federation of State, County, and Municipal Employees, as Press Secretary for the United States Senate Committee on the Budget, and as chief of staff for a New York City congressman. He has a master’s degree in international relations from George Washington University and a law degree from Georgetown University Law Center. He co-found Donnelly, Conroy & Gelhaar, LLP, now one of the city’s leading litigation firms. His legal writing has appeared in the Massachusetts Law Journal and the Massachusetts Lawyers Weekly. In February 1865 three "commissioners," all prominent members of the Confederate government, met with Abraham Lincoln and Secretary of State William Seward on a riverboat near Hampton Roads, Va., to explore the possibility of a negotiated end to the Civil War, an event briefly portrayed in the recent film Lincoln. Our One Common Country is the story of that meeting.